Ms. Rashmi Rajpal v. Klienz Herbal (P.) Ltd. 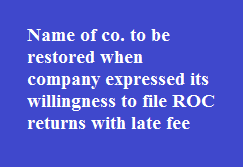 The applicant submitted that she would be able to complete filing of pending Annual Returns and Financial Statements, when the name was restored and change its status from 'Strike Off' to 'Active' in the Register of Companies maintained by the ROC it was also submitted that applicant was ready to file pending returns and income tax returns as required under the Act and thus sought direction to change the status of the company to active from strike off. As per section 252(3), a company, or any member or creditor workman, if they feel aggrieved by striking off its name can approach the Tribunal by way of application, before expiry of 20 years after date of publication. On being filed an application, the Tribunal can order to restore striking off company on its role, if it is satisfied that the company was, at the time of its name being struck off, carrying on business or in operation or otherwise it is just that name of a company be restored to the Registrar of Companies.